Female representation in video games needs some work. While more games are presenting female characters as options for players to choose, especially in western role playing games, this choice of gender usually has no story or mechanical change within the game. This lack of representation leads to a major problem. Without a playable female character the story of the game is presented through the lens of the male protagonist that is already over represented in media. This removes options for writers of video games’ stories to present events with a different context. This means that women in general are shown with less agency. It only takes one damsel in distress to reinforce the idea of female subordination, while it takes many active player characters to try to combat that. For example, in the first Kingdom Hearts game, Sora is on a quest to find his friends and save multiple worlds from darkness with the power of a magical weapon called the Keyblade. Sora is the only playable character in this game and the only point of view for the game’s entire story. As the player, we guide him through saving his two friends, the male friend-rival Riku, and the female friend-damsel-in-distress Kairi. Riku’s story is one of betrayal, active hostility towards Sora, and eventually redemption, with several of the game’s key boss fights being against Riku. As another young boy, Riku gets to be an active participant in the story, often seen as an equal or better than our protagonist. Kairi, however, spends most of the game in a daze, unable to talk or help anyone including herself. She requires rescuing from danger by both of her male friends. Kairi joins other classic Disney princesses such as Snow White and Cinderella in this role, as all need rescued by either Sora or their own Prince Charming. On the other hand, we have Kingdom Hearts: Birth By Sleep, the first and only game in the series to feature a non-optional female playable character. There are actually a total of three playable characters, two male, Terra and Ventus, and one female, Aqua, and the player must play through all of their stories in order to beat the game. Aqua is also the only playable option for the game’s final chapter where the plots of all three stories are wrapped up. This forces players to become comfortable with the mechanics of playing as Aqua. 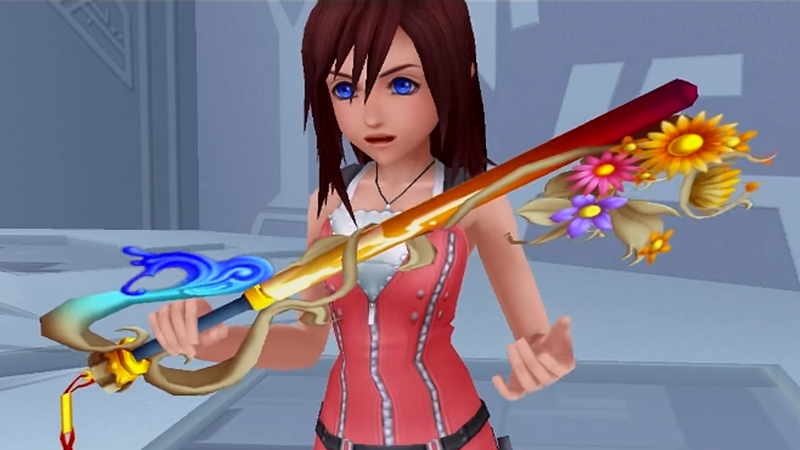 At the beginning of the story, no matter which character you play as, Aqua receives the title of Keyblade Master for completing her training. By naming Aqua as Master and allowing the player, regardless of the player’s gender identity, to take control of her and facilitate in her growth in power and skill, the game portrays a capable and powerful woman who is also allowed to be nurturing and loving at the same time. This adds a complexity to Aqua and to the game itself that would be lost if one could only play as her male friends. Even the non-playable female characters receive greater agency, with scenes like Cinderella actively defying her abusive family. With the number of video games published increasing year after year, the importance of including a playable female character cannot be overstated. Give us another Princess Peach game. Give us Legend of Zelda with the titular princess as the playable character. Give us Kairi getting a Dive Into the Heart sequence at the start of a Kingdom Hearts game. Give us more playable female characters. Edit: Updated time of publishing because I don’t know how drafts work.